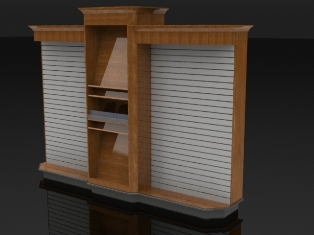 Our standard full-facing wall unit. 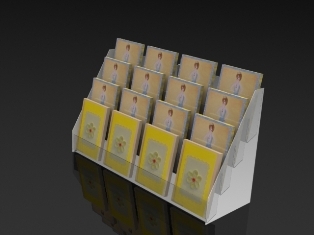 It is ideal for high-quality cards, when you want to be sure the customer is able see the entire card facing. Divider fins sold separately. The SS1a is the same as the SS1, except we use a slat wall back panel for versatility. This allows you to place acrylic shelves or other items on portions of the fixture, rather than exclusively card holders. Our standard high-density card wall. A high density wall card display with room for signage above each bay. 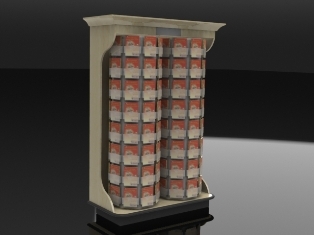 This is ideal for displaying as much product as possible in a tight area. About 2/3 of the card face is visible on each row. 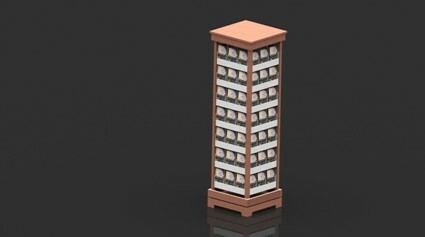 You may place dividers between each fixture or have them in one continuous row. 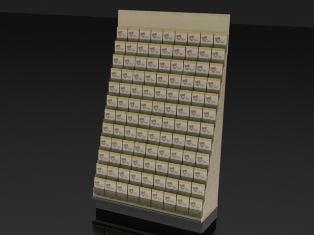 The SS2a is our standard High-density card wall display without the storage area. 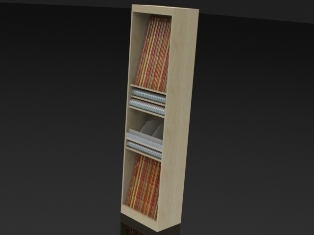 This is ideal for displaying as much product as possible in a tight area. About 2/3 of the card face is visible. You may place dividers between each fixture or have them in one continuous row. There is an area for signage above each bay. 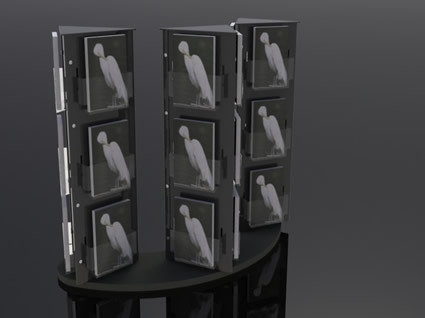 The SS24 is our standard tall high-density card unit. You can integrate the SS24 with the SS6 roll wrap display, and a slat wall for gift bags and cards for a custom all-in-one. The heavy duty base with ABS kick and bumper guard make this unit perfect for high-traffic areas. Divider fins sold separately. 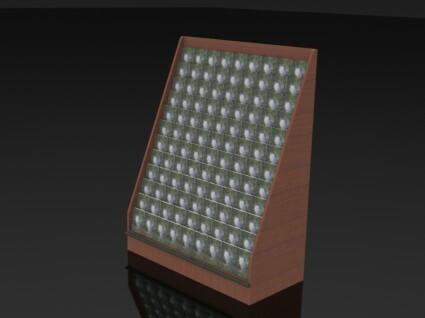 The SS47 is a high-end four-sided spinner display that will really set your product apart. 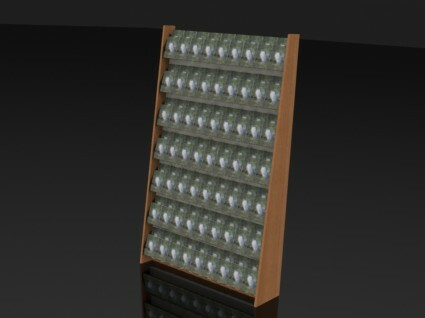 The SS4 is our standard free-standing spinner display. 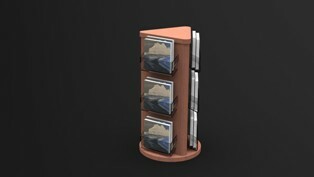 It is a great way to affordably display cards. There is a customizable signage area above the cards. The spinner is on casters, which makes it easy to move around the store. The SS4b is the SS4 without the signage area on top. It is an affordable way to add an upscale look to your card collection. The SS4a is a double-spinner unit that has a protective base with a bumper guard. It is ideal for high traffic areas. 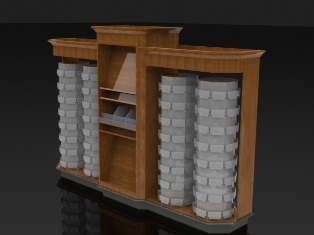 The SS5 is our double-spinner wall unit with crown molding. It is a great way to highlight your card and stationery area: the rich crown molding attracts the eye and draws customers to the product. The base is protected by a heavy duty bumper guard. Our standard roll wrap display. Standard width is 24", but it can be ordered in any size up to 60". It can also be customized with crown molding. 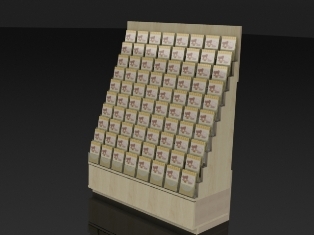 The SS3 is our standard free-standing card display, accented with wood end panels. 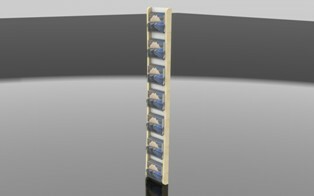 The mid-panel is a slat wall, so the SS3 can also be ordered with card holders on one side only, which allows you to place hooks or shelving on the other side. Sign holders can be ordered separately. 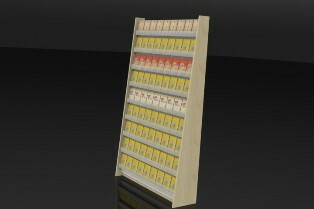 The SS3a is our standard free standing card display in a 2' version, accented with wood end panels. The mid-panel is a slat wall, so the SS3a can also be ordered with card holders on one side only, which allows you to place hooks or shelving on the other side. Sign holders can be ordered separately. The SS18 is our fully customizable all-in-one unit. You can display cards, ribbon, roll wrap, boxed notes, and more. Custom lengths and widths are available. We can also design this in curved or L-shapes. The SS21 is a great way to draw customers to you product. 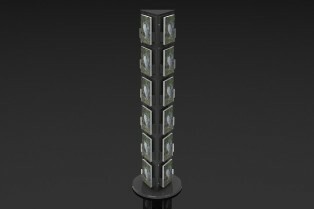 It is fully customizable in length and height. The durable base makes it perfect for high-traffic areas. 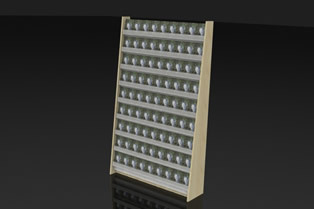 Slat-wall panels provide a variety of display options. 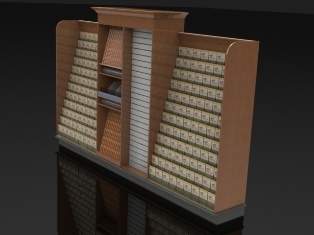 The SS23 is an attractive way to display cards and roll wrap in one unit. It is fully customizable in length and height. 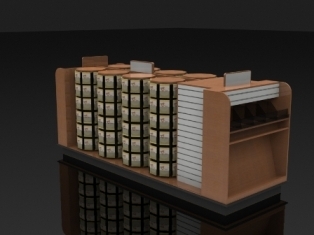 The SS25 shows what can be done by integrating the SS24 high-density card wall with the SS6. 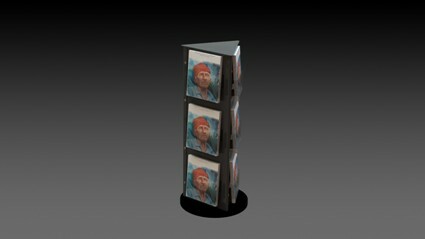 It is a fully customizable all-in-one unit. 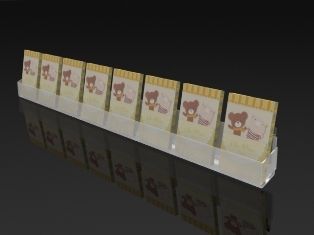 The SS28 is an affordable countertop black acrylic card-display with clear acrylic holders. It can be a reminder for the customer to buy a last-minute birthday, anniversary, or other special occasion card. It displays nine full facings. The SS30 is the similar to the SS28 but has a wood finish. The SS34 is an affordable way to display cards on a countertop. It can be work as a last minute reminder to buy a birthday, anniversary, or other special occasion greeting card. The SS33 is a curved array of three counter-top spinners. 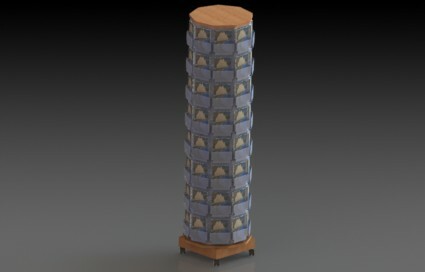 An affordable free-standing spinner unit. 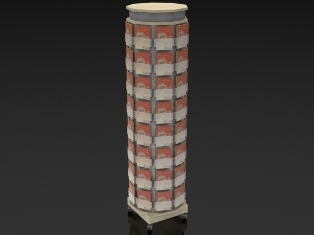 The SS29 displays a vertical column of cards in a limited amount of space. 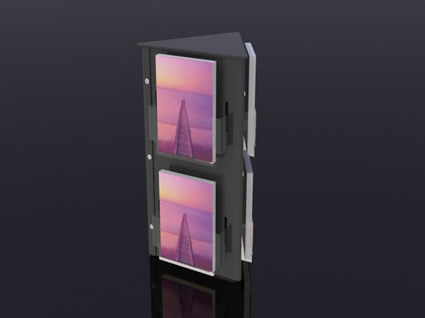 The SS7 is our standard double-tier acrylic card holder. It comes with metal slat-wall hooks, and attachment hardware. 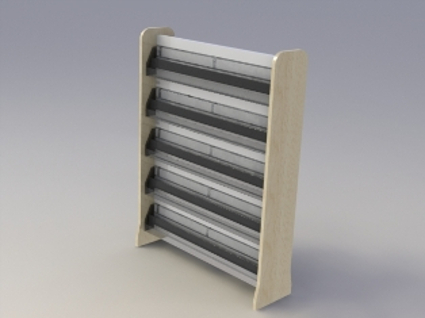 The SS7 can be placed every 9" on slat wall. The acrylic is shipped in a carefully designed box to prevent damage. 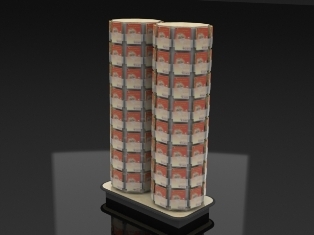 Width: 24", 36", or 48"
The SS7a is our standard triple-tier acrylic card holder. It comes with metal slat-wall hooks, and attachment hardware. 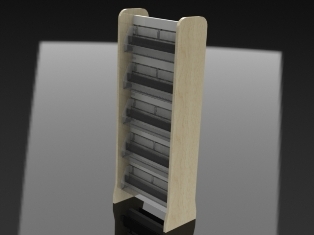 The SS7a can be placed every 9" on slat wall. The acrylic is shipped in a carefully designed box to prevent damage. 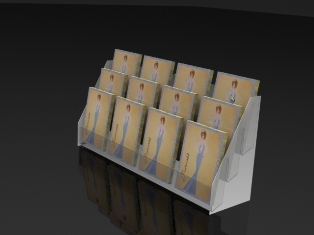 Width: 24", 36" or 48"
Our standard four-tier acrylic card holder. It comes with metal slat-wall hooks, and attachment hardware. The SS7b can be placed every 9" on slat wall. The acrylic is shipped in a carefully designed box to prevent damage. 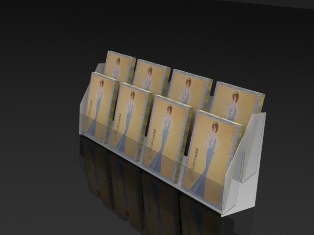 Our standard single-tier acrylic card holder. It comes with metal slat-wall hooks, and attachment hardware. The SS7 can be placed every 9" on slat wall. The acrylic is shipped in a carefully designed box to prevent damage.